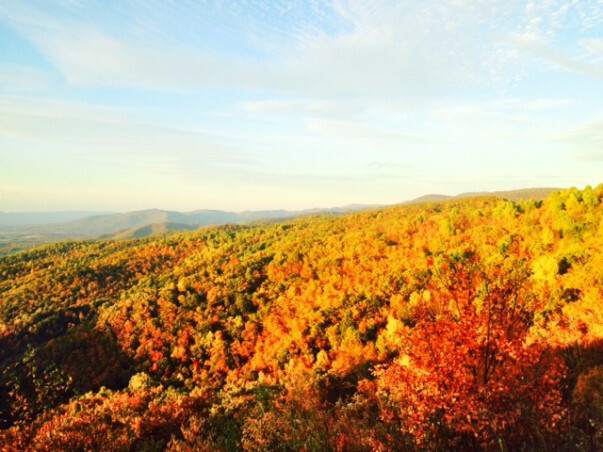 Shenandoah National Park – Spectacular Fall colors! I first moved to the United States for Business School to a quaint little town called Charlottesville, home to the University of Virginia. This was a few years before the unfortunate incidents this lovely southern town has witnessed in recent times. Amidst apprehensions of making the biggest move in my life, little did i realize that this historic Jeffersonian town was nestled in the picturesque Blue Ridge Mountain Valley, encompassing the Shenandoah National Park, world reknowned for its spectacular fall colors. Shenandoah Valley National park boasts of 200,000 acres of forest, trails, waterfalls & Skyline Drive vistas. A two hour drive from Washington DC on US Route 29 South will lead you to Charlottesville and the options to explore Shenandoah from there on are endless! It is no wonder then that thousands from all over the country drive down to witness these warm fall hues. The foliage and landscapes display an exceptional color play all spring, fall and winter alike. Shenandoah never stopped to amaze me. Walks back and forth school and home were always a burst of color! You can spend your afternoons slow brunching and wine tasting at some exceptional vineyards like Pippin Hill, Monticello, and King’s Family Vineyards. These vineyards are also a popular destination of some magical weddings! Charlottesville hosts the Annual Foxfield races which are nothing short of Virginian royalty. (And UVA undergrad drunkenness!). Just make sure to carry your best sundresses, fascinators and pastel colored shorts to really indulge in some true southern cultural experiences. In the 18 months that i spent in C’ville, the moments i most fondly remember were the ones spent hiking and driving in Shenandoah and lazing in the Vineyards…of course business school classes seem to fade away into oblivion. Between the craziness of school and wanting to make the most of on-campus activities, it is a shame i didn’t visit this beautiful national park more often…here is hoping we change that soon! My first foray into exploring the US National Parks was with colorful Shenandoah and there has been no looking back since. Be it a relaxed weekend getaway, or a sweat-breaking 10 mile hike, Shenandoah National Park will not disappoint. Cheers to lovely fall colors, sunshine, and lots of wine! Ps: The few pictures that were taken were with an iPhone 5. Look out for the Grand Canyon National Park travelogue next! Previous US National Parks – Why you should visit them! Next Grand Canyon National Park – Grandest of them all! Pingback: Grand Canyon National Park – 2 of 59 – Life on a post-it!